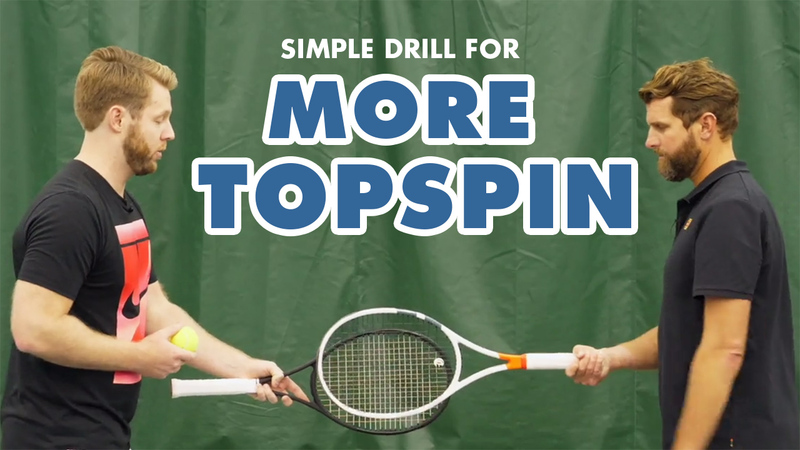 Today we show you a simple drill to get more topspin. This video is for players with a PlayYourCourt rating of 59 and below. – Hey guys, Scott from playyourcourt.com here, and today I’m gonna show you a simple drill to hit with more topspin. So, today we’re talking topspin, and this video is for players with a PlayYourCourt rating of 59 and below. If you’re not in our community or familiar with our rating system, this is the equivalent of an intermediate level tennis player, or a USTA 3.0. So, I know a lot of you struggle with topspin, and you’d maybe heard the term brush from your coaches, or just form other players. And I think we hear it a lot, but maybe we don’t necessarily understand what brush up the back of the ball actually feels like, so what I wanna show you today is a simple drill that’ll not only help you visualize, but actually feel what we, as coaches mean when we say brush up the back of the ball. So, if you’ve got a friend that’s going to jump out on the court with you, and slow things down, and drop-feed some balls for you, there’s a great drill that you can do that’ll really help you not only visualize, but feel what we, as coaches mean when we say brush up the back of the ball. I’d like to show you that now. So, in this drill, I’m the helper, Nate’s the person working on his topspin. What I’m gonna do as a helper is I’m gonna lay my racket out in front of Nate perpendicular towards the ground. I’m gonna have him match my racket directly in front. So, you’ll see from the side angle here, that his racquet is directly in front of mine. When I drop-feed the ball for Nate to hit, his racquet is gonna dip underneath my racquet, and then as he swings, he’s gonna have to maneuver back underneath my racquet before he brushes up the back of the ball. What this racquet does, it creates an obstacle that you have to work underneath that creates that extreme brush that we as coaches are looking for. So, let’s take one more look at that. I want you to really pay attention to the path of Nate’s racquet, how my racquet creates an obstacle that’s creating that sharp brush up the back of the ball. Let’s take a look. Perfect. So, one last thing I want to address here, ’cause I know people are gonna ask the question, why is Nate going underneath my racquet? Shouldn’t Nate be creating a loop? Well, that just depends on your skill level. We talk to beginners about how we’re not gonna add that loop on day one. 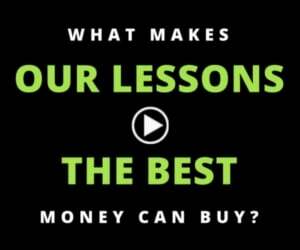 So, if you’re past the phase in your forehand where you’re just pulling straight back, and focusing on low to high, and you are hitting the loop, let me show you what that drill looks like. It’s the exact same concept, but instead of Nate going underneath my racquet, he’s gonna go over my racquet using his normal loop, and then do the exact same thing, work underneath my racquet, and brush aggressively up the back of the ball. Let’s take a look. So you might be thinking, Scott, that’s great, but what if I don’t have a buddy that’s willing to come out here and slow things down and do drop-feeds. Is there anything I can do when I’m rallying or when I’m playing matches to think about this? And the answer is definitely yes. Just visualize an obstacle. You remember back from the drill, what makes this work, is there’s an obstacle in front of the ball. So, as Nate was swinging, my racquet was in front of the ball, causing him to have to maneuver underneath it and brush up sharply. So, what I want you about when you’re hitting when you’re playing matches, same concepts, just visualize an obstacle in the way of the ball that you’ve gotta maneuver underneath and brush aggressively up the back of the ball. If you can visualize this and implement it as you are hitting, I think you’ll find it’s a lot easier to understand this brush motion, and to hit with a lot more topspin. So, I hope you enjoyed this video. 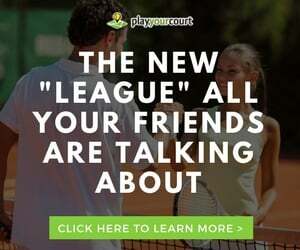 I really want you to improve your tennis game. The problem is, I don’t really know anything about you or your skill level, so what I want to do, click the button below, answer a couple of quick questions for me about your game. I’m then gonna send you custom, tailored content with things that you specifically need to be working on to improve your game. Just click the button below, answer a couple of questions, and I’ll do the rest.